Not with VPower NFS ! I tried but without success with Agnet backup policy or with a backup job : on linux server. Could you tell me if it 's possible and how do that ? Please clarify what exactly do you mean by "save NFS mount"? Are you referring to configuring NFS share as a target for Agent? That is possible if you choose "NFS" radio button on "Shared Folder" step. I just want to save a shared nfs dir. you dont save this directory. Oh, I think that now I see what you mean. In order to save files from NFS share, you have to configure snapshot-less file-level job for agent. Please check this page - you need to select "Backup directly from live file system" checkbox. I m testing again the NFS mount point to save in "Object section" but with "File level backup " option. In our VMware environment, as with everyone else's, we back up both Windows and Linux VM. Since I'm newer to the community, I have a rookie question.We have a few Linux VMs that have NFS mounts on them. When the backup is performed, are these NFS mounts backed up as well? Yes, you can configure snapshot-less file-level job for an agent, which should save files from NFS share. Still sticks at status 0% backup in progress. Although agent performance might be far from ideal on a large set of small files, 90 hours and 0% is a bit too much. Please contact support team for investigation and post your case ID. NO... not NFS mounts . But normally with 9.5U4 these is a way to save it. I try to find how to do that ..
Just to clarify something about VBR U4 functionality - unless you use file-copy job or deploy Veeam Agent for Linux on VM, there is no other way to back up NFS shares that are mounted inside the VM. 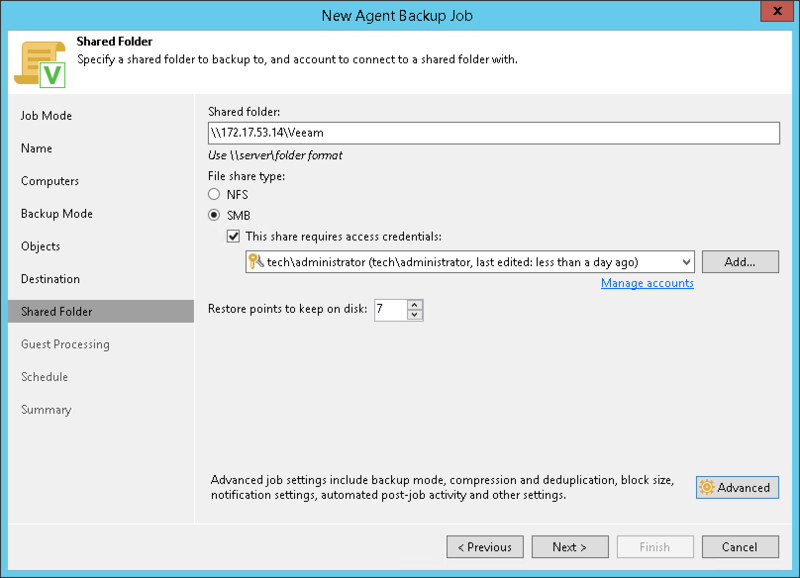 So an agent backup policy can't save a NFS backup ? It can - you need to select the snapshotless mode in the policy settings and specify the local NFS share mountpoint as the backup source (NOT a network path to a share). Thanks! For information it works but so slowly (more than 16 days when i stopped it).